so, we never really had much of a winter here in LA, which is why spring greens are appearing mid-winter. 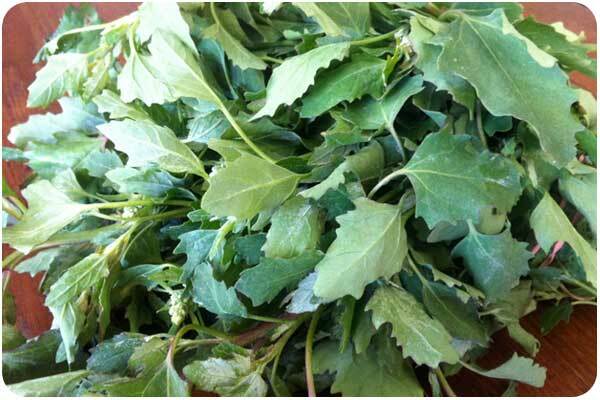 a selection of wild greens has shown up at the highland park farmer’s market, including lambsquarters, which you can forage all over los angeles. since i haven’t had any first-hand experience with this edible weed, i thought i’d start by buying it, so i’d have a better sense of what to look for when foraging. lambsquarters is similar to spinach, and distantly related. it’s got a soft, toothy texture, which would make it a nice addition to salads. the leaves are fuzzy on the under-side, so you’ll probably want to wash them, to minimize this. preheat oven to 350º if using a large oven, hold off if using the toaster oven. pull the leaves from the stems of all lambsquarters and wash in a colander. chop the onion and sauté in butter over medium heat until translucent, 5 minutes. add vinegar, water and the lambsquarters leaves, cover and turn heat down to low, wilt the leaves 5 minutes. uncover and sauté until lambsquarters are sufficiently wilted and liquid is cooked down. 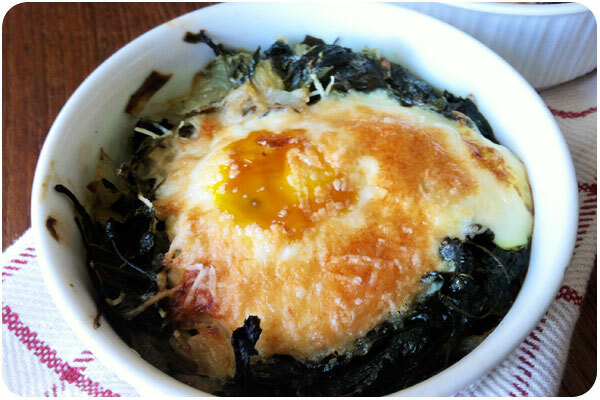 place a scoop of the sauté mix into 2 ramekin dishes, crack an egg over each, sprinkle parmesan over the top and bake 20 minutes at 350º, or shorter if you prefer soft-cooked eggs. How much is half a bunch of lamb’s quarters? Could you give number of cups or weight? Thanks. oh, sorry, i was referring to the bunches usually sold in farmer’s markets. i’d say it’s about 2 cups.